Have you heard about the disgraced NBA owner Donald Sterling? Yes? Perhaps even his mistress, V. Stiviano? Yes again? Well, let’s check on world events. Have you heard about the crisis in Ukraine? The sunken ferry in South Korea? The missing airplane in Malaysia? Yes to all? You’re doing great! Let’s try some more. Can you tell me about the slaughter of Christians in Egypt? No? How about in Iraq and Syria? Oh, you didn’t know that Christians were being killed there? Perhaps you can tell me how many Christians have been killed in Sudan in the last two decades? Not really? Not even sure where Sudan is on the map? Then let’s try this. Have you heard of Boko Haram? Perhaps? Maybe you’ve heard that strange-sounding name recently in conjunction with nearly 300 girls being kidnapped somewhere in Africa? Does that ring a bell? Sadly, while America obsesses over the Donald Sterling scandal (which is certainly a scandal), and while we follow with interest the events in Ukraine (could Putin really be a Hitler in the making? ), and while our hearts rightly break over the terrible loss of life in South Korea and the apparent (and also terrible) loss of life in the Malaysian Airlines mystery, we are all but oblivious to the suffering of Christians worldwide. Sadder still is the inaction of our government when it comes to this Christian suffering. In Syria, Christians have been beheaded, crucified and killed in other horrific ways for refusing to convert to Islam. They are targeted by both Sunni and Shiite Muslims in the civil war there. As for Sudan, which is located in northern Africa, while some Americans are familiar with the name Darfur, very few know that as many as 2 million Christians died in Sudan at the hands of Muslim armies over the last 20 years, and Christians are still being killed there today. The problem, of course, is that Boko Haram has indeed been murdering and maiming and pillaging “for many years now,” yet most Americans are only hearing about it now. Yet we know who V. Stiviano is, and we have an opinion on the Donald Sterling scandal? Something is very wrong when we know more about Kim Kardashian’s latest fashion statement than about the slaughter or kidnapping of hundreds of Christian children in Nigeria. What? Twenty-two days after the fact he says that “time is of the essence”? This bears eloquent witness to our national apathy and indolence when it comes to the plight of our Christian brothers and sisters worldwide. Where was our outrage in late February when Boko Haram Muslims “stormed a Nigerian secondary school campus … locked a boys’ dormitory and set it on fire, killing those who tried to flee and burning the rest alive”? You say you didn’t hear about that? You didn’t hear about the screams of dozens of schoolboys who were burned alive? But you’re aware that Jimmy Fallon replaced Jay Leno and that Stephen Colbert will be replacing David Letterman? Isn’t there something terribly wrong with this picture? It is reported that, “Since 2009, the Boko Haram insurgency has killed thousands of people in its campaign to rid [Nigeria] of Western influence and impose strict Islamic law,” yet most of us are just finding out about their murderous deed today. 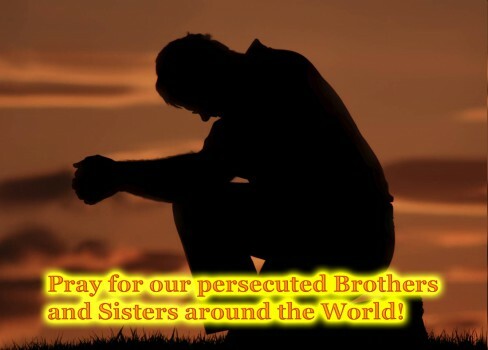 Don’t we owe it to our persecuted and martyred brothers and sisters worldwide to learn about their plight and, at the least, raise our voices and prayers on their behalf? Visiting sites like Voice of the Martyrs and Open Doors and International Christian Concern is a good place to start. Media wishing to interview Dr. Michael Brown, please contact media@wnd.com.